A 22-year-old male was admitted with signs of acute decompensated heart failure. 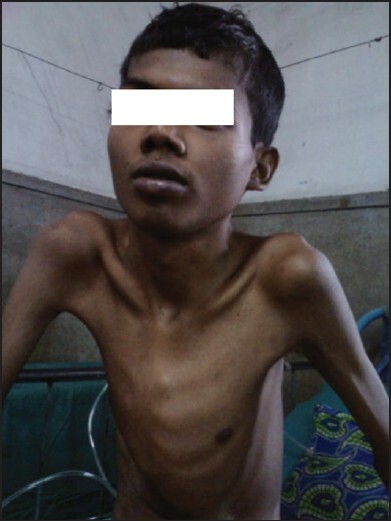 The physical examination revealed anterior precordial bulging with scoliosis, his blood pressure was 100/60 mmHg, his heart rate was 110/min with atrial fibrillation, neck veins were distended, and crepitations were present at the basal regions of his lungs. [Figure 1] A grade 3/6 pansystolic murmur and a diastolic flow murmur were present at the anterior axillary line, and there was peripheral edema. 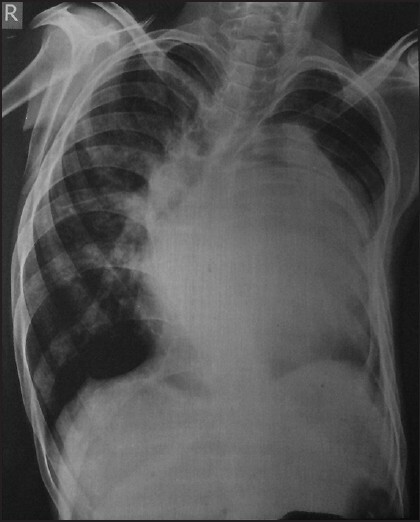 Chest radiography revealed cardiomegaly (cardiothoracic ratio, 0.74) leading to splaying of the carina, an elevated left main bronchus and severe thoracic scoliosis [Figure 2]. Echocardiogram showed massive left atrial enlargement, cleft anterior mitral leaflet, double mitral regurgitation jets, a small ostium primum atrial septal defect, and an (7 mm) inlet ventricular septal defect [Figure 3] and [Figure 4] - both with left to right shunts. 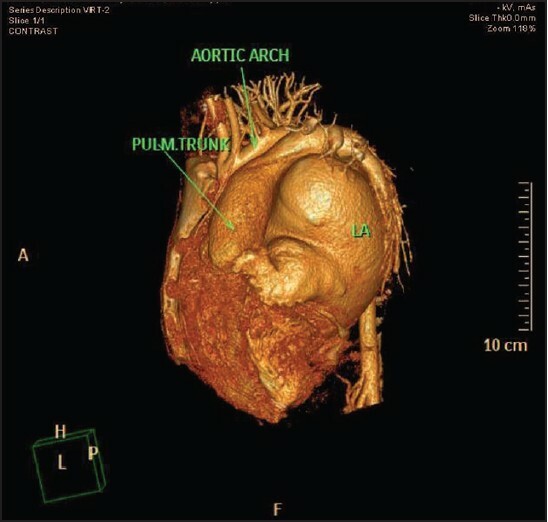 A diagnosis of "Giant Left Atrium" (GLA) with partial atrioventricular septal defect was confirmed by cardiac computed tomography (CT) scan [Figure 5] and [Figure 6]. 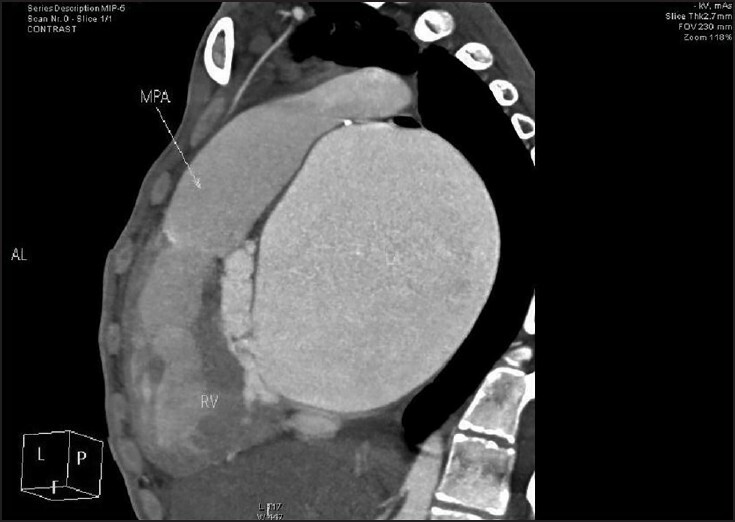 Maximum diameter of left atrium (LA) recorded by CT was 14.4 × 12.4 cm. [Figure 7] and LA volume was 840 ml. The patient was judged to be in New York Heart Association (NYHA) functional class IV. 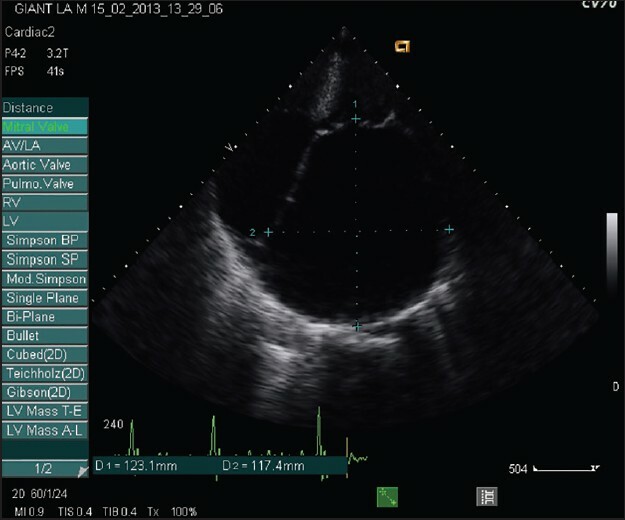 After initial attempt to stabilize him with infusion of furosemide (6 mg/hour) and isosorbide dinitrate (5 μg/min), he was referred to cardiac surgery department for LA size reduction and corrective surgery for the atrio-ventricular septal defect, as clinical and echo parameters predicted only a moderate pulmonary hypertension. Intra-operative findings confirmed the structural defects. The patient's post-operative recovery was briefly punctuated by surgical wound infection; otherwise, patient has improved, with NYHA status at present class II/IV. 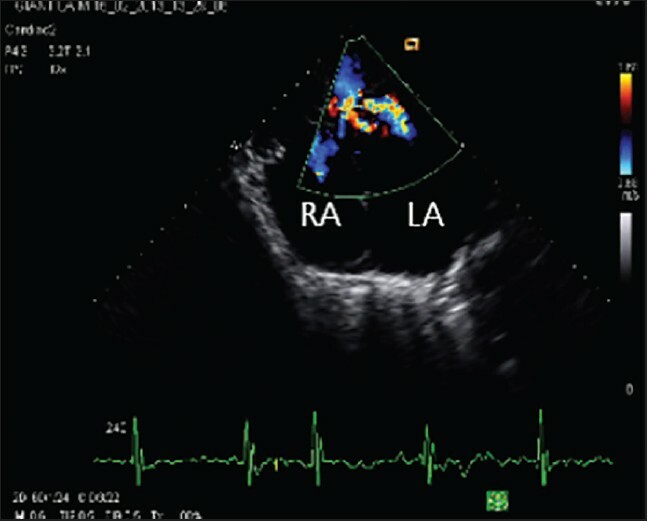 This case probably represents the largest ever "non-rheumatic" GLA reported, demonstrating the extent to which a LA can expand even in a congenital heart disease condition. Although not many reports of "non-rheumatic" GLA are available but its identification is essential because of the complications associated. GLA can be associated with atrial fibrillation, thromboembolic complications, hemodynamic, and respiratory complications. GLA may lead to skeletal changes in the thorax related to direction of enlargement of LA; as in non-structural (postural) scoliosis seen in our case. Surgical options for GLA are divided for either performing mitral valve surgery with left atrial volume reduction or performing mitral valve surgery alone. A giant LA is an indication for the initiation of anti-coagulant therapy. Piccoli GP, Massini C, Di Eusanio G, Ballerini L, Tacobone G, Soro A, et al. Giant leftatrium and mitral valve disease: Early and late results of surgical treatment in 40 cases. J Cardiovasc Surg (Torino) 1984;25:328-36. Isomura T, Hisatomi K, Hirano A, Maruyama H, Kosuga K, Ohishi K. Left atrial placation and mitral valve replacement for giant left atrium accompanying mitral lesion. J Card Surg 1993;8:365-70. Ozkan A, Tuncer A, Ozkan M. Giant left atrium. J Am Coll Cardiol 2012;60:e13. Pande A, Sarkar A, Ahmed I, Chandra NG, Patil SK, Kundu CK, et al. Non-invasive estimation of pulmonary vascular resistance in patients of pulmonary hypertension in congenital heart disease with unobstructed pulmonary flow. Ann Pediatr Cardiol 2014;7:92-7. Phua GC, Eng PC, Lim SL, Chua YL. 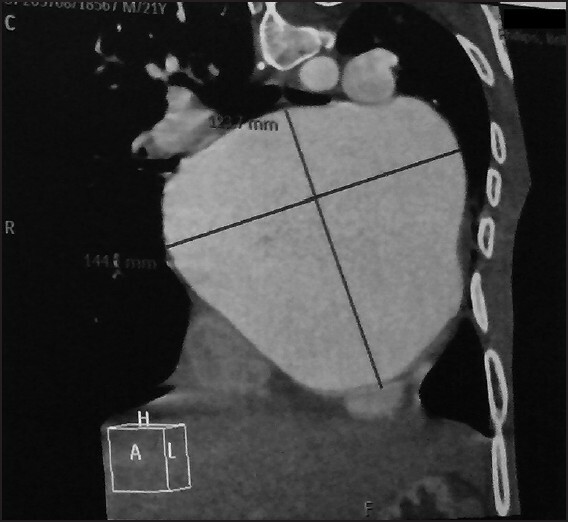 Beyond Ortner′s syndrome - Unusual pulmonarycomplications of the giant left atrium. Ann Acad Med 2005;34:642-5. Scoliosis. Suken A. Shah, MD - Nemours. Available from: http://www.nemours.org/content/dam/nemours/wwwv2/filebox/service/medical/spinescoliosis/scoliosisguide.pdf [Last accessed on 2014 Jul 25]. Apostolakis E, Shuhaiber JH. The surgical management of giant left atrium. Eur J Cardiothorac Surg 2008;33:182-90.